The weather in Dallas in absolutely gorgeous right now! Aside from the wind, I have been dreaming up ways to try to do my job poolside. Springtime usually gets us all in the mood for home improvement projects, especially those outdoor projects. My list continues to grow. 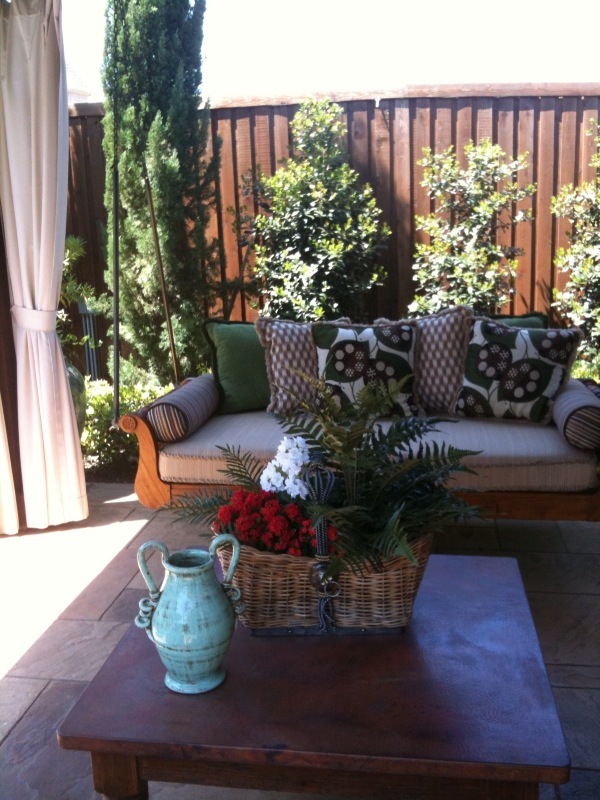 It got me thinking… is your outdoor space IN style? I took the photo above in my parent’s pool cabana. It showcases one of my all time favorite outdoor elements. I call it the swinging sofa. It’s a deep outdoor sofa that is made to function like a classic porch swing. It’s perfect for lounging & reading a book or taking a nap or just to sit & swing! It’s hung from the cedar beams of the cabana. My daughter’s favorite design element is the lady bug print pillows out of sunbrella fabric. We often pile on it to sit & talk or watch TV. Ahhhh, so comfy, relaxing & peaceful!